Having explored almost all of Penang Island, I have to say that the Penang Waterfall has always been one of those places that I have wanted to explored, and until now, have not gained access. 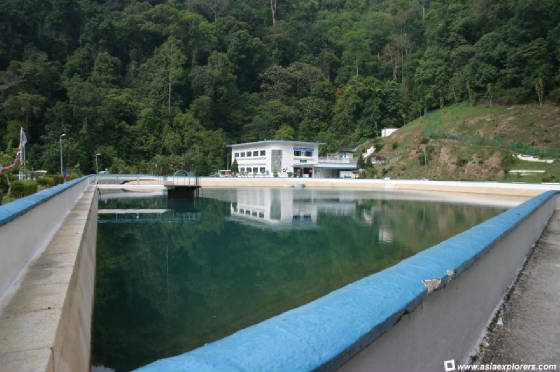 The thought of having to seek approval from the Penang Water Authority (Perbadanan Bekalan Air Pulau Pinang) seemed too tedious a task, so for all these years visiting the waterfall was put in the backburner. 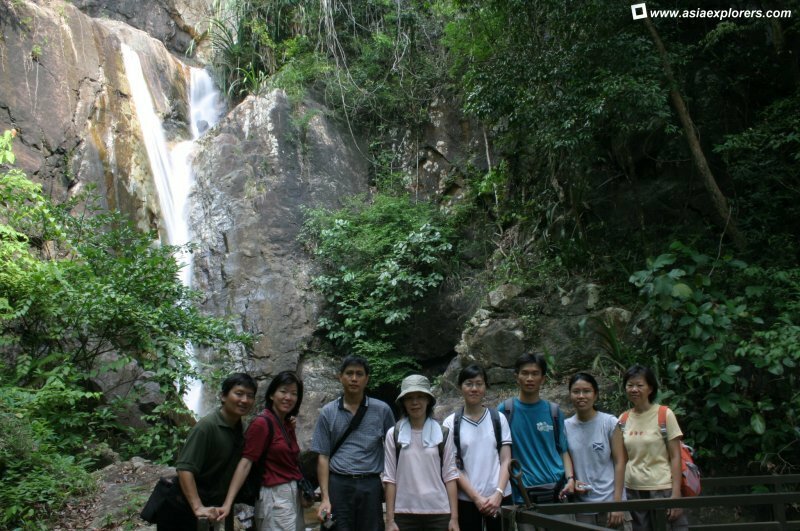 As luck has it, I learned from one of our AsiaExplorers members that the Friends of the Penang Botanic Gardens, a non-governmental organisation, is now organising monthly visits to the waterfall. So I quickly registered myself for the visit - and at the same time, signing up to be a member of the society. Like most Penangites, I was introduced to the Penang Waterfall through the colonial watercolours hanging in the Penang State Museum. 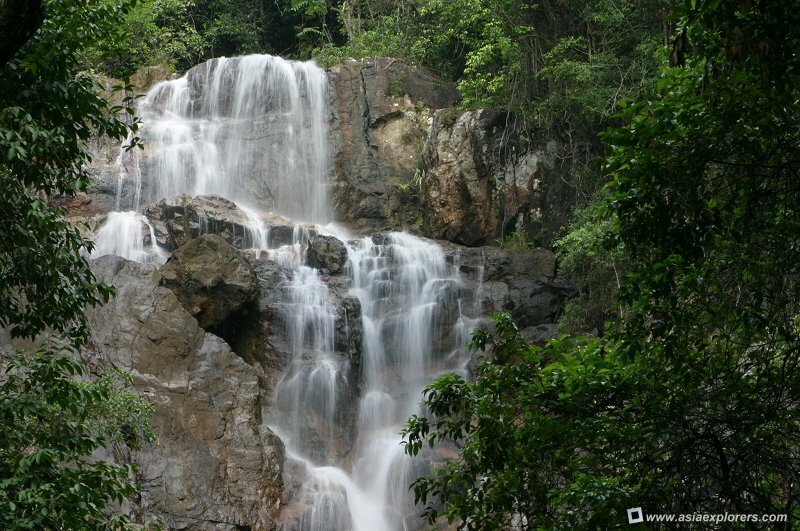 I often heard of the Penang Waterfall through the "older generation" within my family. Aunties and older brothers would speak of the waterfall within the Botanical Gardens, and how much the young generation missed out in having their access to the waterfall cut off. Indeed, to them the botanical gardens should rightfully be known as the Waterfall Gardens, and the road leading up to it is Waterfall Road, or Jalan Air Terjun, not the present-day Jalan Kebun Bunga. However, somewhere in time, there was a shift in emphasis from the waterfall to the gardens. The "somewhere in time" was in the sixties or early seventies, when the Penang waterfall was closed off to the public as a safety measure. It was done during the Confrontation between the newly independent Malaysia and Indonesia. However, though the turbulent episode is now a page in history, the waterfall has never again been open to the public. Hence, entire generations of Penangites have grown up not knowing the existence of this fall or to appreciate it being there. It must have been an awesome sight. Early visitors to Penang Island described it as one of the key attractions of the island, including Ibrahim Munshi, son of the well-known Abdullah Munshi, who described it in his journal, the Kisah Pelayaran. 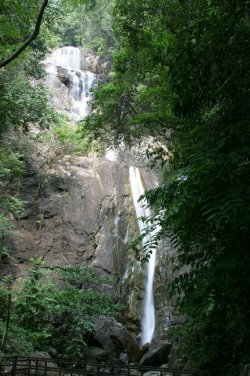 Indeed, the waterfall was an important source of water for ships calling at Penang port in the early part of the 19th century. In 1805, an aquaduct was erected to channel water for the fall via Pulau Tikus to a reservoir near Leith Street Ghaut and Hutton Lane respectively. 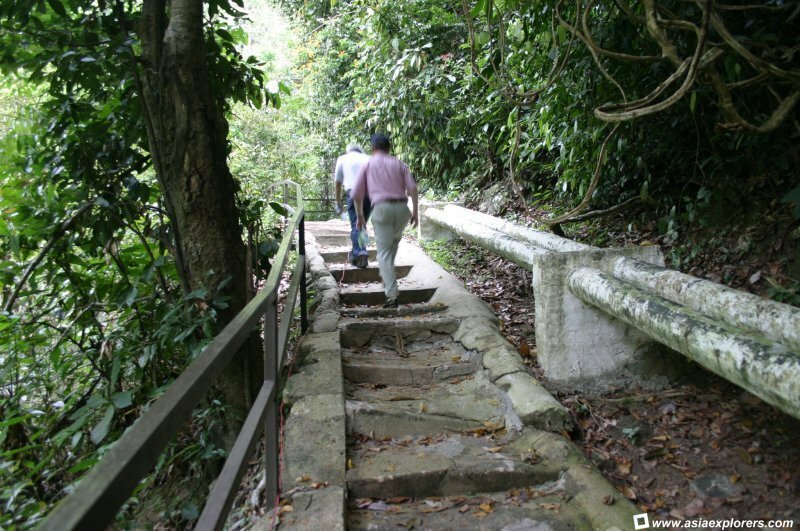 The quality of the water, filtered through the aged rocks of Penang Hill, was very high, and was described by the early sailors as "sweet". That it happens to be within the water catchment area vital to the supply needs of the island has resulted in the Penang Waterfall being closed to the public. In actual fact, only a small proportion of Penang water supply comes from this particular source - only 10-15% of the population is lucky enough to get their water from here, while much of the island gets its water supply comes from Sungai Muda, on the border of Penang and Kedah. 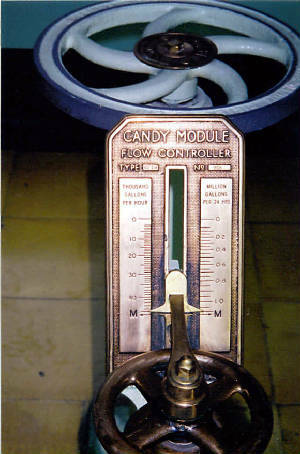 The quality of this water supply has long been recognised. In 1804, the first water treatment plant in Malaysia was set up here, to supply to the needs of 10,000 people in Penang. The oval-shaped reservoir of the Penang Waterfall was constructed in the gardens in 1892 by British engineer J. MacRitchie (the same municipal engineer who in 1894 lend his name to the MacRitchie Reservoir in Singapore). It was reconstructed in 1950. 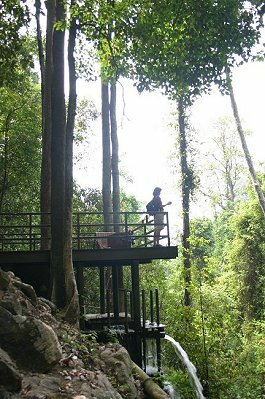 In around 1910, after the Penang Botanical Gardens were established, the water authorities considered enlarging the reservoir by blocking access to the garden and flooding the valley. Thankfully that plan was not carried out, and the gardens were saved. The visit to the Waterfall today, organised by the Friends of the Penang Botanic Gardens Society, as attended mostly by members of AsiaExplorers. The tour was conducted by Dr Liew of the society. In addition to the waterfall, we were also given a tour of the gardens, but I shall leave the description of the gardens to another time. 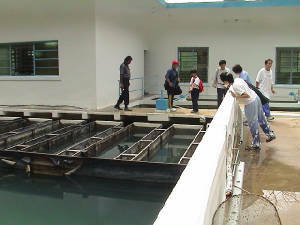 To reach the waterfall, we first entered the water treatment plant of the Penang Water Authority (PBA). To do that, Dr Liew has to present an authorisation letter from the PBA. We were shown how raw water was made ready for consumption. Then we climbed the steps to visit the waterfall. By the look at the steps, they must have been placed there at least a hundred years ago, and probably more. Before we reached the waterfall, we could hear it from a distance. And we could see the Sungai Air Terjun that runs off it on our left. Finally we saw the famous waterfall, and it was indeed a sight to behold. Below it was the famous bridge that appears in so many old paintings. The Waterfall consisted of three main falls, each time emptying into a pool. On the third fall, it separates into two parts that joins back to form a Y. According to Dr Liew, during the wet season, the two sections of the fall merge to form a single cascade of water. The height of all the falls total about four hundred feet. We spent the next twenty minutes or so shooting the falls to our hearts' content. I find it difficult to properly represent the fall on photograph. Since it is so huge, it appears like a small stream of water when photographed in whole. To better appreciate the gushing water, I showed sections of the fall. Contact us for additional information and dates about the visit to the Waterfall and the reservoir.